CarGurus has 72,401 nationwide Explorer listings starting at $750. The choice of a capable V6 or an economical 4-cylinder engine, some pleasant ride and handling characteristics, seating for 7 in 3 rows, a posh cabin and a plethora of standard and available high-tech features star in Ford’s next-gen 2012 Explorer. Disappointing cabin and cargo room, frustrating glitches in some of the techno-features, lazy pickup from the 4-cylinder powerplant and pricy upper trims may deter a few tire-kickers from the 2012 Explorer. Though it’s not the brute it once was, the 2012 Ford Explorer nevertheless offers the growing family a capable and well-endowed crossover alternative. Deceiving exterior dimensions, alas, belie a somewhat cramped cabin, and the available EcoBoost 4-cylinder engine has yet to prove itself adaptable to anything but downtown errand-running. However, the standard V6 provides a plethora of pep, cabins are admirably equipped, and 3 rows of seating allow plenty of passenger accommodation. How the mighty have fallen. Once a proud full-size SUV and a must-have for the average American family, the Ford Explorer, in its 2012 iteration, is a mere shadow of its former self. The original was a truck-based behemoth that towed tons of trailer, went just about anywhere and flaunted an intriguing bad-boy look, with the muscle to back it up. This generation of Ford’s once-popular workhorse, now boasting sedan-like unibody construction and a more pavement-friendly suspension, has evolved into a still-practical people-hauler with less emphasis on the brawn and more on the gizmos. In any case, after significantly altering the shape, size and capabilities of the Explorer line in 2011, Ford offers the 2012 edition Explorer as a 7-passenger midsize crossover. A brand-new turbocharged EcoBoost 4-cylinder powerplant is now available to the entire Explorer lineup and is promised to put out nearly the giddyup of the standard V6 while getting best-in-class gas mileage, though this promise has yet to be fulfilled, according to a number of reviewers. Once again, three trims are offered; the base Explorer, midlevel XLT and the flagship Limited, all of which boast 3 rows of seating, standard front-wheel drive (FWD) and 80.4 cubic inches of cargo space, with the rear seats folded. Though total cargo space is a bit less than many rivals, a respectable 21 cubic feet of cargo area behind the third row ought to be plenty for groceries or a few suitcases. Of course, 4-wheel drive (4WD), sans low-range gearing, is available in all three trims, with the available Terrain Management System giving this heady crossover some surprisingly adept off-road capability. Do not, however, attempt to compete with, say, a Range Rover in mountain-taming expertise. The Explorer, alas, simply won’t survive. Once again, MyFord Touch and the popular SYNC system are optional in the higher trims, and there lies the gremlin in the Explorer machine. These things, though admirable in conception, rarely work as advertised, and for some reason, the problem seems especially noticeable in the Explorer lineup. Ford is alleged to be aware of the myriad glitches in its highly touted techno-babies and is working feverishly to correct them, but for the moment, don’t expect seamless operation from the more exotic of the Explorer’s self-proclaimed state-of-the-art voice and touchscreen communications, navigation, climate control and audio functions. Finally, Chevy’s third-row-compatible Traverse and Honda’s refined though pricy Pilot are among the Explorer’s main competition. Mazda’s nimble CX-9 and Toyota’s popular Highlander also rival Ford’s hefty crossover ute, with all of the above lacking the size of the Explorer, but certainly providing an abundance of interior room and comfort. Jeep’s Grand Cherokee, an off-road beast that’s taken to the task of providing family-friendly transportation, might also be worth a look. 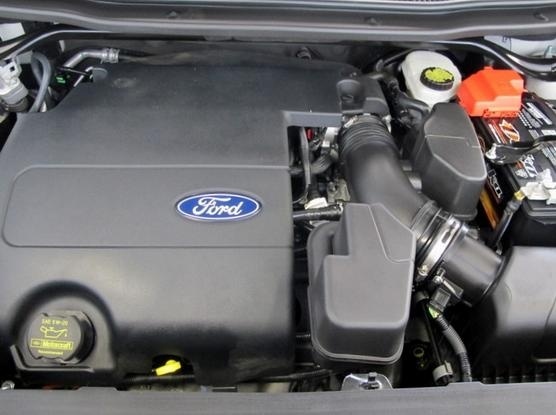 For 2012, Ford’s regenerated Explorer sports a standard variable-valve-timed (VVT), ethanol-ready flex-fuel (FFV) 3.5-liter V6 powerplant that throws out 290 hp at 6,500 rpm. The six-banger mates with a 6-speed shiftable automatic transmission for some 255 lb-ft of torque at 4,000 rpm, with descent control coming standard on 4WD trims. An optional towing package readies this cunning crossover to haul up to 5,000 pounds of trailer, while mileage is estimated at 17 mpg city/24 highway from FWD trims and 17/23 from 4WD editions. Optional in the FWD trims only is a turbocharged inline 4-cylinder (I4) EcoBoost engine that again mates with the 6-speed shiftable automatic (though with revamped gear ratios) for 240 hp at 5,500 rpm and 270 lb-ft of torque at 1,750-4,000 rpm. The four-banger is only rated to tow up to 2,000 pounds, but mileage is estimated at a class-leading 20/28. The available 4WD system, meanwhile, features Ford’s touted Terrain Management System, whereby the driver can select one of four modes to electronically suit traction to conditions. This unique traction control system gives the Explorer a bit of an edge over many competitors in light off-road duties. Reviewers find the new turbo I4 EcoBoost to be just a tad sluggish from a stop—well, some find it more than just a tad—but several agree that once it gets going, the four-banger performs adequately on the highway and is seemingly custom tailored for downtown errands. The 6-speed automatic, meantime, is uniquely geared toward its I4 protégé and noted to be smooth enough most of the time. A number of reviewers mention, however, that when left in true automatic mode, this otherwise competent automatic occasionally demonstrates some harshness in downshifting. The V6, on the other hand, though touted as the most powerful in its class, has, in the minds of a number of reviewers, little to recommend it over most other similarly powered crossovers. However, reviewers do concede that the Explorer’s standard six-banger steps up power in a silky and steady progression to crescendo when needed for merging and passing. One review has the V6 providing the punch of a V8 without the mileage woes. Additionally, most reviewers are enthusiastic in their praise of the virtually glitch-free performance of the V6’s accompanying 6-speed automatic. At least one test of the I4 had it timed from 0-60 in a somewhat pokey 9.1 seconds. Testing the V6 resulted in a 0-60 time of 8.3 seconds, which is about right for the class. Both engines, according to a majority of reviews, sound reasonably spirited, though a few report a certain lack of refinement on the part of the V6 during heavy acceleration. Though not exactly posh, the 2012 Explorer’s 4-wheel independent suspension combines with its unibody construction for a decently composed ride. Bolstered by a short and long arm front end, a multi-link rear suspension and stabilizer bars front and rear, Ford’s hefty midsize crossover handles even rough roads with a minimum of difficulty. Sporting 17-inch steel wheels, the base Explorer, believe it or not, gives the most refined ride of all, according to most reviewers, while, with their 18- and 20-inch alloy wheels, the XLT and Limited trims, respectively, subject occupants to a bit more wheel chatter over bumpy pavement. The I4-equipped XLT, incidentally, gets standard low rolling resistance tires this year. Unfortunately, reviewers find that the Explorer, though not in the same league as either of GM’s comparable crossovers, does a reasonably good job of smoothing out all but the most atrocious roads. With its well-tuned electric power steering, Ford’s downsized ute saves gas and can be fitted with the automaker’s available Auto Park feature. Steering does, alas, feel a bit on the feathery side to the majority of reviewers, but its considerable body weight and wide stance result in a better grip in corners and an alert response to changes in direction. Though not at the same level as Mazda’s smaller, and therefore more nimble CX-9, the Explorer isn’t totally out of its element on winding back roads and distinctly outperforms many rivals when taken a bit off the beaten path. Finally, braking is described in most reviews as powerful and true, but several opine that the pedal displays an overabundance of give. Tests showed the V6-equipped trims coming to a stop from 60 mph in 122 feet, about average for the class, while an EcoBoost I4-equipped trim used up 130 feet in coming to a controlled stop. Traditionally, Ford autos provide a comfortable, if not plush interior, and the company's once kingly midsize crossover lineup is no exception. The base Explorer, for instance, comes with a roof rack, rear spoiler and power-adjustable mirrors outside, while cloth upholstery and front bucket seats with a 6-way power-adjustable driver’s seat enchant occupants inside. Reclining second-row seats, remote power door locks and power windows also come standard, along with cruise control, telescoping tilt-wheel steering and the impressive MyFord trip computer. Front and rear air conditioning keeps folks cool, while front and rear floor mats keep things spiffy, and all these assets are complemented by simulated alloy cabin trim accents. Finally, entertainment is offered via an MP3-capable single-CD player with 6 speakers. The midlevel XLT, meanwhile, throws in standard power-adjustable front seats, premium cloth upholstery, digital keypad power door locks and heated power mirrors, while rear parking sensors provide some confidence when reversing. Of course, added cabin accents interact well with the leather and simulated alloy steering wheel, while the standard subscriber voice directions navigation system is complemented by Bluetooth hands-free calling, satellite radio and a USB connection. Moving up to the Limited, expect to encounter leather upholstery, wood, leather and simulated alloy interior accents, an 8-way power-adjustable power driver’s seat (still with 4-way power-adjustable passenger seat), heated front seats and power-adjustable pedals. Keyless entry and ignition, meantime, is complemented by a universal remote garage door opener, rear-view camera and tri-zone climate control, not to mention memory for up to three drivers' settings. Lastly, a standard 390-watt Sony premium audio system sports 12 speakers, including a subwoofer, as well as 5.1 Surround Sound and a memory card slot. Options, of course, depend on trim level and location, with lower trims eligible for a number of items found standard in their upper-level siblings. A Class III towing package is offered for all trims, and includes a hitch and wiring, along with added engine cooling, Trailer Sway Control and Trailer Brake Control wiring. All trims can additionally be equipped with roof rack crossbars and Ford’s touted SYNC voice directions system for communications, audio and climate controls. Both the XLT and Limited are additionally eligible for the available MyFord Touch/SYNC interface with its dashboard-mounted 8-inch touchscreen display that includes a GPS-based navigation suite. Further options in the XLT and Limited trims include a trio of Rapid Spec packages that include a power liftgate, second-row console and captain’s chairs, a dual-panel power moonroof, remote engine start and rear-seat DVD entertainment. Finally, as befits its flagship status, the Limited is additionally eligible for upgraded 20-inch wheels, perforated leather upholstery, heated and cooled front seats, power-folding third-row seats and, for the parallel-parking-challenged, Active Parking Assist, either as standalone options or in Rapid Spec package form. Reviewers generally regard the Explorer’s cabin as comfortable, if not especially roomy. Interior materials are noted to be pleasingly textured and reasonably plush. The MyFord Touch/SYNC interface does, however, continue to disappoint nearly all reviewers with its often frustratingly inept performance, though most concede that, with some serious tweaks, this system could be a comfort and convenience breakthrough. Otherwise, gauges are noted to be large and legible, and seating, especially the leather seats found in the Limited, to be long-haul comfortable and front legroom to be more than adequate. Rear-seat, and especially third-row occupants will, according to most reviews, find things a bit more cramped, especially considering the fact that second-row seating is unavailable with fore and aft sliders. In its family-oriented role, the 2012 Explorer lineup displays an admirable list of standard safety features. Four-wheel antilock brakes with electronic brakeforce distribution, as well as traction and stability control are complemented by 3-row head airbags and dual front side-mounted airbags with head protection chambers, all of which are standard across the lineup. All three trims are additionally equipped with a post-collision safety system, while the XLT and Limited editions boast standard turn-signal-integrated mirrors, front fog/driving lights, dusk-sensing headlights and a remote antitheft alarm. Ford’s blind-spot warning system (BLIS) is optional for the XLT and Limited, as are rear inflatable seatbelts. The National Highway Traffic Safety Administration (NHTSA) gives this hefty crossover its second-highest 4-star rating in overall safety, with 4 stars awarded in front impact and rollover testing, and its highest award of 5 stars given for side-impact protection. The Insurance Institute for Highway Safety (IIHS), meanwhile, has graced Ford’s downsized ute with its Top Safety Pick for 2012, awarding its highest rating of Good in front and side impact tests, as well as in roof strength and rear impact/head restraint testing. Alas, many owners reflect the opinion of reviewers in finding the available MyFord Touch and SYNC systems to be problematic in the 2012 Explorer, with voice recognition, touchscreen and navigation functions all coming in for a share of complaints. As for interior room, owners cite the exterior size of this quasi-hulking crossover to be deceptive when they confront actual cabin space, and the immoveable second-row seats additionally gather a share of owner complaints. The I4 is subject to a bit of owner criticism for its sluggishness from a stop, though virtually all agree that fuel savings make up for its perceived pokiness. Unfortunately, the V6 engine is, in the opinion of several owners, not up to advertised mileage expectations. On the plus side, Ford’s once hugely popular ute gets owner kudos for the available power-folding third-row seats, along with impressive second-row legroom despite its moribund placement. Ride comfort is lauded by many owners, as are build quality and the number of standard features found in the higher trims. Several owners agree that quality cabin materials and a pleasing, if not show-stopping, exterior design are among the positives in this capable crossover, while its award-winning safety features go over especially well with those toting family and friends hither and yon. 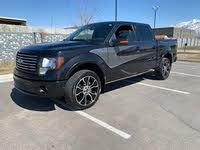 What's your take on the 2012 Ford Explorer? 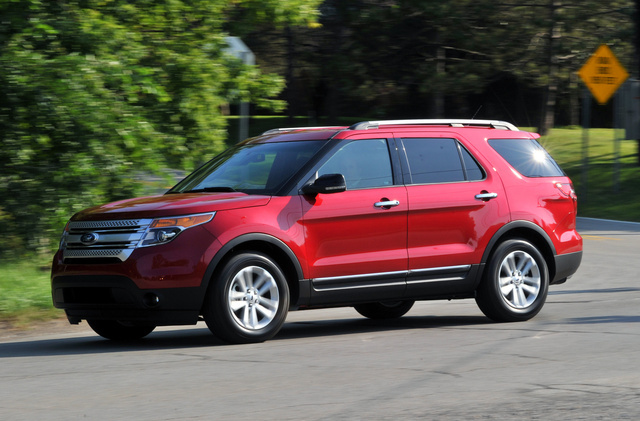 Users ranked 2012 Ford Explorer against other cars which they drove/owned. Each ranking was based on 9 categories. Here is the summary of top rankings. Have you driven a 2012 Ford Explorer?